What happens when a parent first expresses concern about a toddler’s speech development? How can a parent know whether a child is simply a late-bloomer or is having more serious developmental issues? I’ve been there. I can walk you through the process. But I’ll tell you right now, I don’t know exactly where this road will lead us. Unfortunately, this is often the first thing parents hear when they talk to a pediatrician about a toddler’s lack of speech. Although it’s true that some children start speaking on their own without any intervention, this advice does not give parents any recommendations to encourage their children’s communication skills. Parents are the best teachers in this area, and I learned that there are plenty of evidence-based methods that fit into everyday life at home. How many words does your child have? Speech milestones on the developmental charts are flexible because of the vital roles of non-verbal communication and social skills in early development. But when pressed, pediatricians and speech therapists usually say that a child should have about 3 spoken words (including partial words) at age 12-18 months, 50 to 200 words at age 2, speak in sentences by age 3 and tell simple stories by age 4. 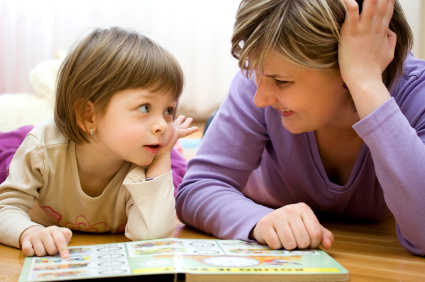 A child is considered “significantly” delayed in speech if he or she has a vocabulary of fewer than 5 words at age 2. But there are many ways to be delayed in language. For some, it is a matter of oral motor skills, for others it is a lack of understanding of the function of language. One book that has been helpful to me is The Parent’s Guide to Speech and Language Problems by Debbie Feit, because it explained how to read developmental charts and how to identify several types of speech and language disorders. When was the child’s most recent hearing test? My older son’s speech therapist explained to me that a child may be able to hear some sound frequencies but not others, which can affect the ability to speak and cause behavior problems. In the USA, a hearing test is usually covered by insurance if the test is prescribed by a physician. Ask your pediatrician for a referral to a pediatric audiology lab with specialized equipment for non-verbal toddlers, so that the test results will be as accurate as possible. What does your child do to communicate a need or want? Most children spend their first year of life developing non-verbal communication skills. Around 12 to 18 months of age, a child should be able to coordinate eye contact, gesture (such as pointing) and sounds (not necessarily words) SIMULTANEOUSLY to make a request. In toddlers, the use of words is much less important than the simultaneous coordination of these three types of non-verbal communication. A developmental psychologist told me upfront that if my son was not able to do this, then he had a developmental delay. What my son did instead is a classic sign of autism: avoiding eye contact, he took my hand and used it as a tool to try to open a box of pretzels. Children with appropriate communication skills do not use another person as a tool. I knew then that my older son would need years of therapy. Does your child have difficulty chewing or swallowing? A speech therapist or physician will check your child’s muscle tone around the face, mouth, neck and upper body. Some neurological disorders, such as dysarthria, can cause difficulty with speaking and eating due to weakened oral muscles. Which sounds does your child make? Most children around the world start with ma and ba sounds. Not my kids. My older son started with da and ka; my younger son with ish, uk and oonk. Their speech therapist said that this was a symptom of atypical speech development. But any sounds are a good sign, and if they’re combined with other skills, that’s an even better sign. A few days after my younger son’s first birthday, I laughed until I cried: my baby started clapping his hands and pointing while vocalizing and making eye contact. He had the non-verbal skills that his brother lacked. His late speech development was a source of constant, intense anxiety for me, but all of those communication skills did suddenly transform into complete sentences with excellent pronunciation one day when he was 31 months old. His speech therapist was on vacation that week.